Phone HM Land Registry by calling their general enquiries contact number 0300 006 0411 for technical support when performing an online property search to compare house prices in different areas. Likewise you can request detailed property details if you are planning on purchasing an area of land for either personal use or for a business venture. Moreover if you are selling property privately you should call this helpline for up-to-date information on the fees charged for land transfer, documentation changes and If you are a homeowner and you have a boundary dispute with your neighbour then you can phone this helpline to request that the Land Registry investigates, note that you may be called to a hearing at your local tribunal to provide evidence. Phoning the Land Registry office will cost the same as making a local-rate call to UK telephone numbers starting with 01 and 02 area codes. Therefore you will be usually be charged a per-minute rate and an access fee according to your particular provider’s tariffs. However if you have inclusive minutes you will be able to use these instead of paying these monetary fees, however you will subsequently lose these minutes from your balance according to the length of the call. Lines are open from 8am-6pm Monday-Friday however they will be closed on bank holidays. 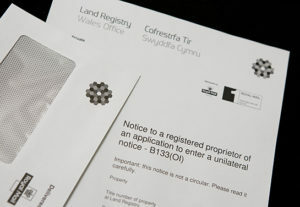 Contact Land Registry on their Welsh language phone number 0300 006 0422 for assistance with property searches, to dispute against a neighbour encroaching on your boundary and for document fees. Cysylltwch â’r Gofrestrfa Tir ar eu rhif ffôn Cymraeg 0300 006 0422 am gymorth gyda chwiliadau eiddo, i ddadlau yn erbyn cymydog sy’n ymgolli ar eich ffin ac am ffioedd dogfennau. Residents who would prefer to write to HM Land Registry can choose from a variety of methods including traditional postal and email addresses. Alternatively you may wish to post on their social media profiles for responses from their staff as well as the general public. HM Land Registry Citizen Centre, PO Box 74, Gloucester, GL14 9BB, United Kingdom. HM Land Registry, Regarding [your company name], PO Box 75, Gloucester, GL14 9BD, United Kingdom. HM Land Registry, Regarding [your company name], DX 321601, Gloucester 33, United Kingdom. To email Land Registry you will have to fill out their online contact form where you can select the nature of your enquiriy and download their full complaints procedure. Government bodies such as HM Land Registry are beginning to use social media platforms as a way of promoting their services to the general public, hence you can browse their pages for updates on their fees and to send public messages regarding a boundary dispute.